It's that time of year again. 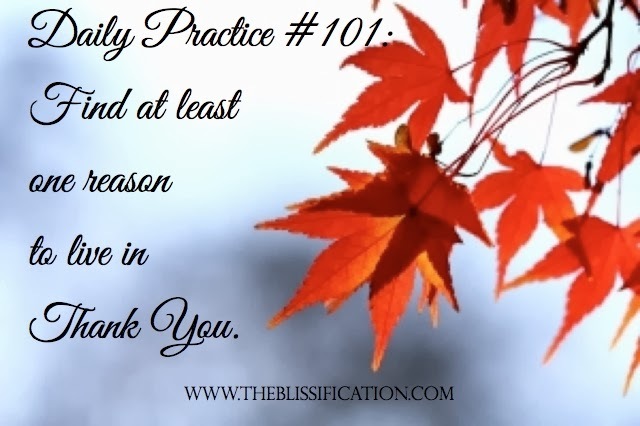 The holidays are just around the corner, and November brings about an annual practice, for some, that includes choosing one thing each day of the month to be thankful for. This sounds like the perfect opportunity to turn a yearly habit into a daily one. It is not necessary to wait for easy or good circumstances to be grateful. Embrace the struggle. It's all right when things don't work out the way you've expected them to. Allow yourself time to grieve. Hell, throw yourself a pity party if you need to. Move through the motions of the experience. Reclaim control over the situation by putting a time limit on feeling your raw, pain-filled loneliness then put a cap on it. Let it control you no further. Focus on moving forward. Don't get so caught up on what should've been-you're giving your past and the people in it too much power. No situation and no person is ever worth surrendering your peace to. Empower yourself to do whatever feeds your soul. You've got a big, bright future to look forward to. Be thankful, regardless of your situation. Don't wait for things to be amazing to figure out what good lies in it.